[By Nick, New for 2014] This might be one of the products I've been most looking forward to trying this year. 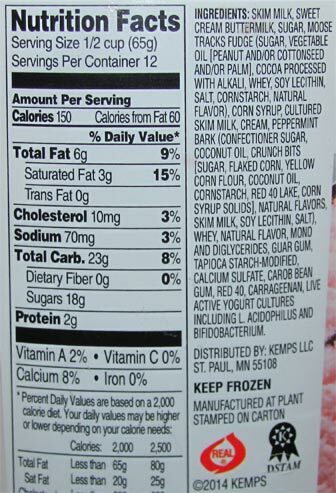 Ever since Moose Tracks announced they would be offering this recipe back in the Summer to companies to produce, I've been on the lookout for potential brands to make it. 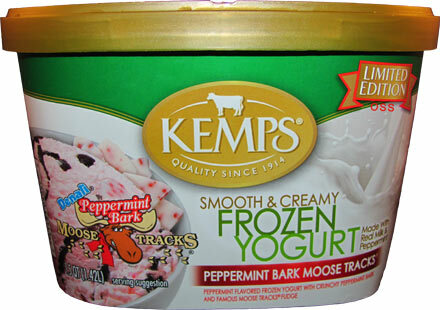 Honestly, I wasn't expecting it to find it as a frozen yogurt let alone Kemp's being the only one in my area to produce it. I mean I've seen their normal frozen yogurts around me for years and Dubba has reviewed some of them. I didn't know they released limited editions and wasn't expecting any place near me to carry them. That was until I stumbled into a random Shop Rite and saw this flavor next to their other limited edition, Cinnamon (that I passed up on). Knowing I wasn't going to be near a freezer though, I knew I had to come back and claim my prize. You guys have no idea how excited I am to be reviewing this product. Okay, I'm not as excited as I would be if this was an ice cream but I have found some frozen yogurts to surpass their ice cream relatives. Let's get right into this! The removal of the lid isn't all that promising. The frozen yogurt seems airy and the mix-ins are pretty much non-existent. Sadly that holds true the more I scoop down the container. The peppermint base tastes exactly like a candy cane which I appreciate, much better than the buttermint vibe I experienced with Yuengling's. Like I expected, the frozen yogurt lacked density and was very airy. Not like a frozen dairy dessert but among the lines of Edy's Slow Churned line. What's worse is that most bites were just only the frozen yogurt and that was beyond depressing. The signature Moose Track fudge was delicious like always but way too minimal. 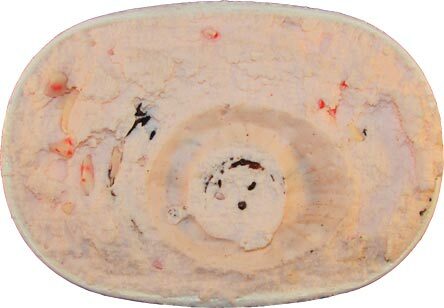 Same goes for the peppermint bark pieces. That might be the biggest letdown given the name of the product and my love of all things peppermint bark. They're literally everything you want from peppermint bark but you maybe come across one in every 4 spoonfuls. I know this is a frozen yogurt and they're trying to be healthier but this isn't acceptable by any means. Especially when I've had other versions of Moose Tracks in froyo form. I'd say pass on this version if you find it. 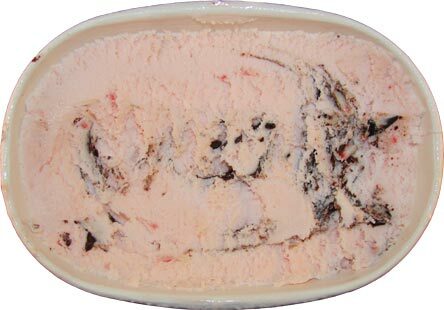 There's much better options and I'm sure there's other companies that are producing this flavor from Moose Tracks that are doing it the justice it deserves. Until I find another version, looks like I'll stick to my go-to Haagen-Dazs for my peppermint bark fix during the winter. Verdict? Where are my mix-ins? Buy Again? From Kemp? No. From another company? Yes.